It is located in Chitadurga, Karnataka in the sylvan surrounding. The Hospital is owned by the Bagamar seva Samiti and it has well pledged Ayurveda, orthopedic and yogic science departments. This hospital has got out-patient department (OPD) and in-patient department (IPD) for 150 beds with well equipped treatment section. The treatment section comprises (1) Kaya Chikitsa (2) Prasooti tantra (3) Koumar brutty (balaroga) (4) Shally tantra (surgery) (5) Shalakya tantra (ENT) (6) Pancha Karma Yoga and also houses sophisticated treatment facilities like (1) Tub Bath 2) Massage Therapy (3) Sun Bath (4) Spinal Bath, etc. 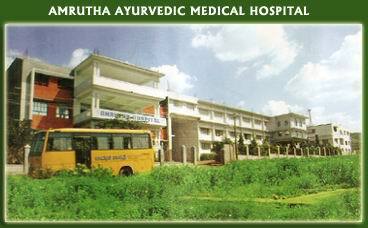 All types of treatment are given here like Panchakarma, Yoga Chikists, well-equipped Maternity section. A special orthopedic wing is working here. It is drawing attention mainly of the illiterate and poor villagers about Ayurveda, the ancient medicines showing its wonderful result making miracles. We do General Surgery and Orthopedic Surgery. Medical check-up camps on Asthama, Arthritis, Diabetes, and Skin Diseases are regularly conducted in the hospital. The dedicated doctors give 24 hours services. The eminent doctors are conducting camps at nearby villages weekly and the medical aid is provided to the needy patients. We are conducting Health checkup camp in surrounding villages every week. And we are conducting eye operation camp. The hospital serves 24/hrs service and has X Ray & E.C.G. Ultrasound Scanning Oxygen Laboratory & all types of facilities are available in the Hospital with Ambulance Service. Address: Behind Onake Obavva Stadium, Chitadurga - 577 501, Karnataka.